He's not like us. What does it all mean? Earlier this week Entertainment Weekly debuted the first official photo from the film Midnight Special, the family-friend science fiction movie from writer/director Jeff Nichols (of Take Shelter, Mud and Shotgun Stories). This is the film that was pushed back after Warner Bros wanted to tweak it a bit, and now it's getting ready for release March next year. 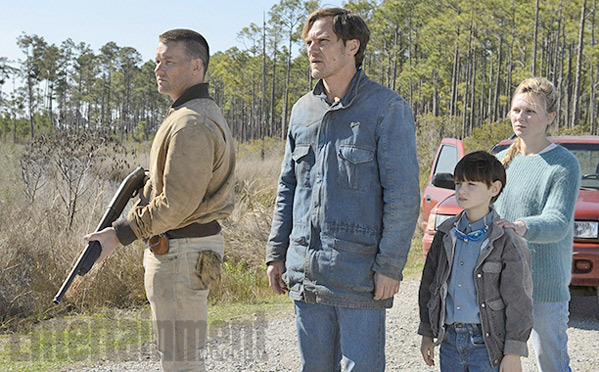 The first photo shows the boy's mother & father, played by Michael Shannon & Kirsten Dunst, with Alton, played by Jaeden Lieberher, as well as Joel Edgerton. The poster gives us a better hint at what's to come, but still vague. 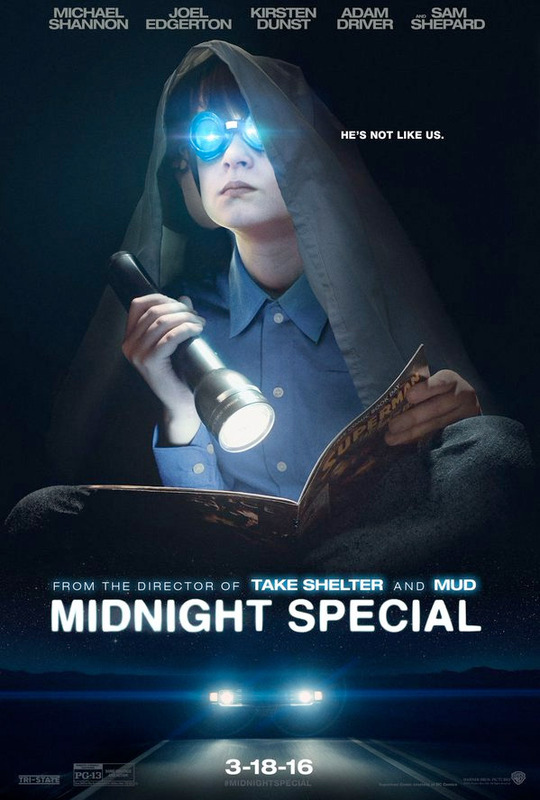 Here's the first photo + poster for Jeff Nichols' Midnight Special, found via Collider. Watch out for a trailer. A father (Michael Shannon) and son go on the run after learning his child possesses special powers. Jeff Nichols' Midnight Special has always been billed as more of a family film, and it has a PG-13 rating. In an interview Nichols explained the origin of the idea behind this: "I want to make a 1960's biker film. I want to make a big, PG summer blockbuster family film, kind of like I want to revamp Tremors. I've got an idea for that. That kind of movie." This is Jeff Nichols' fourth feature film, following Shotgun Stories, Take Shelter and Mud previously. Warner Bros originally had this set for release this Thanksgiving, but pushed it back until next year. Midnight Special now opens in theaters starting March 18th, 2016 next year. Stay tuned. Good cast. Great director. What's not to be excited about? DIG.